Balalaika is a Russian national musical instrument. It is a symbol of a Russian music world, as well as one of the well-known symbols of Russia’s culture and daily life alongside chastushka, Matryoshka, bears, etc. It is not known who and when invented a balalaika. There are a few explanations of its origin. Some of them say that it is a Russia-specific musical instrument; others tend to consider the Turkic origin of this instrument. 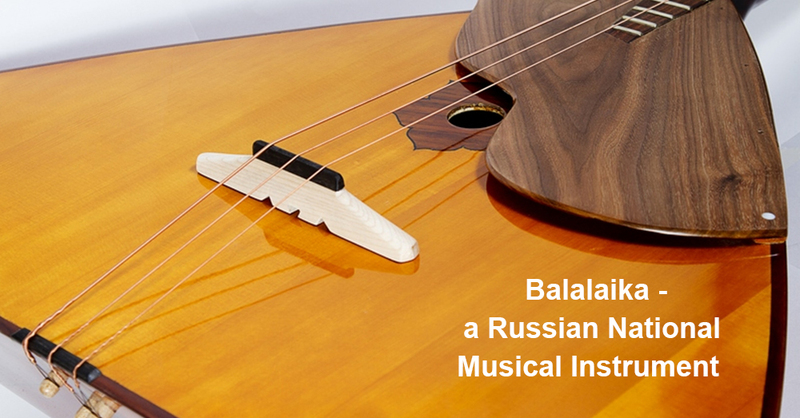 The origin of the word “balalaika” is also vague, although it is very often related to Russia-specific words that mean “to talk about something unimportant, to chat”. Today, balalaika is known in the world as a Russian musical instrument. Those who have never heard about it, at least have seen this amazing stringed instrument with a triangular body. On the Internet you can see a lot of pictures of a bear “playing” the balalaika. In real life, it is not that easy. We have already told you about a Russian bear which is an original symbol, a representation of Russia. A musical instrument a bear is “playing” becomes a symbol of a Russian man. At the same time, looking at these images, it is possible to think that it is very easy to play the balalaika, or that a bear is a talented musician. Neither of these is true. Far from every Russian can play the balalaika, neither bears can. However, a bear playing the balalaika is not an accident, as the balalaika used to be the most popular musical instrument in Russia. In the 18th century journalists used to write: “It is difficult to find a place in Russia where a young worker does not play the balalaika to maids. You can find this instrument in any street-corner shops. However, the main reason for its popularity is the fact that you can make it yourself”. Nowadays, we know balalaika as a tri-chord instrument, but it used to be bi-chord. It sometimes could have only one string, but it could also have four strings or even more. Despite a small number of strings, it is not that easy to learn to play it. It is mentioned by many people that there is lack of balalaika players in Russia today. There is also lack of balalaika players in folk music orchestras. What happened? Why can you rarely listen to balalaika in Russian villages and towns? In the 19th century a seven-string guitar became extremely popular, and it actively substituted a balalaika in the Russian music life. It is difficult to predict what could have happened to the balalaika if Vasily Andreyev, a Russian musician, hadn’t got interested in the instrument. At the end of the 19th century a balalaika player Andreyev founded the orchestra of folk musical instruments that was first in Russia. This made the balalaika a concert instrument. This period is considered as the beginning of the golden age of national instrumental music. Nowadays, lots of musicians around the world are learning to play the balalaika, they found groups and orchestras. Although, earlier the balalaika was considered as a solo instrument and it accompanied village festivities, fairs, family celebrations and even street fights. In 2008 the music community celebrated the International Balalaika Day for the first time. It is celebrated on June 23. This particular date was chosen because on June 23, 1688 the balalaika was first mentioned in historic documents. There are also a lot of other events devoted to this musical instrument.